Back to the regular uniforms...and a win! 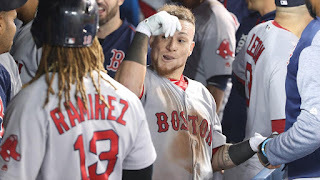 Christian Vazquez (pictured) supplied most of the firepower with a four-for-four night including a two-run homer as the Red Sox beat the Blue Jays 6-5 at Rogers Centre, snapping a four-game losing streak. Drew Pomeranz survived a shaky first inning in which he allowed a pair of Toronto runs to pick up his 14th win of the year. He went six innings giving up three runs on seven hits and five walks. He struck out four. Trailing 2-0, the Red Sox pushed across single runs in the second and third innings on a throwing error that allowed Hanley Ramirez to score and a solo home run by Eduardo Nunez. After the Blue Jays retook the lead in the fourth, the Red Sox rallied for four runs in the top of the seventh inning, two of them coming on Vazquez's fourth home run of the year. Craig Kimbrel allowed a two-run homer in the ninth to make the game close, but picked up his 30th save of the year. Ramirez, dropped to seventh in the lineup, Nunez, Andrew Benintendi and Mitch Moreland each had two hits in the win. The victory, combined with a 6-2 Cleveland win over the Yankees, increased the Boston lead in the American League East to 3.5 games.